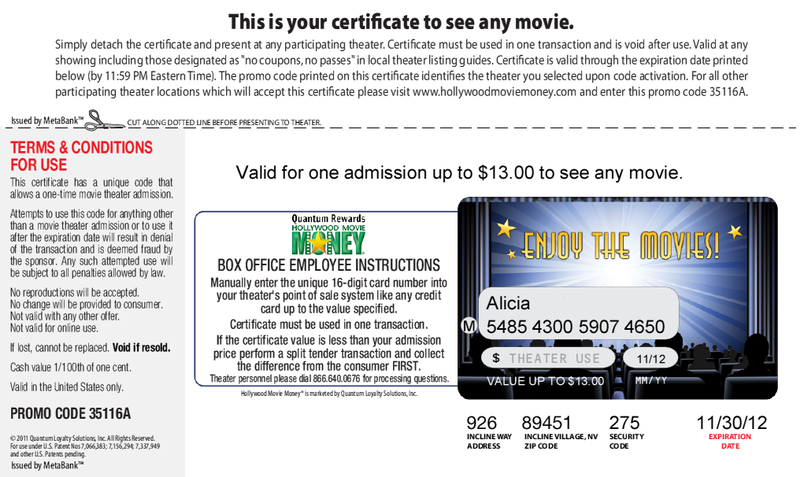 We love going to the movies but we don’t get a chance to go very often so, when I was given a reward code to redeem for a free ticket to Finding Nemo 3D from Hollywood Movie Money, I couldn’t wait to redeem it. 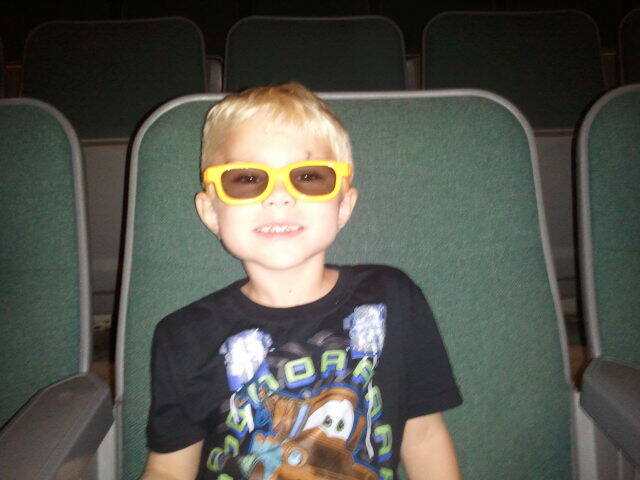 We have seen Finding Nemo numerous times but never in 3D so I was excited to take Jacob on a mommy & son date. We would have gone as a family but Lucas won’t wear the glasses and will just sit and watch a blurry movie so we figured it would be best if he stayed home with daddy. I went online to the website I was sent with my reward code and a form came up on the screen. After filling it out I was brought to another screen where I had to choose which theater I wanted to use my Movie Money at. I found that every theater located in the towns around me that I could think of was on the list as accepting it. 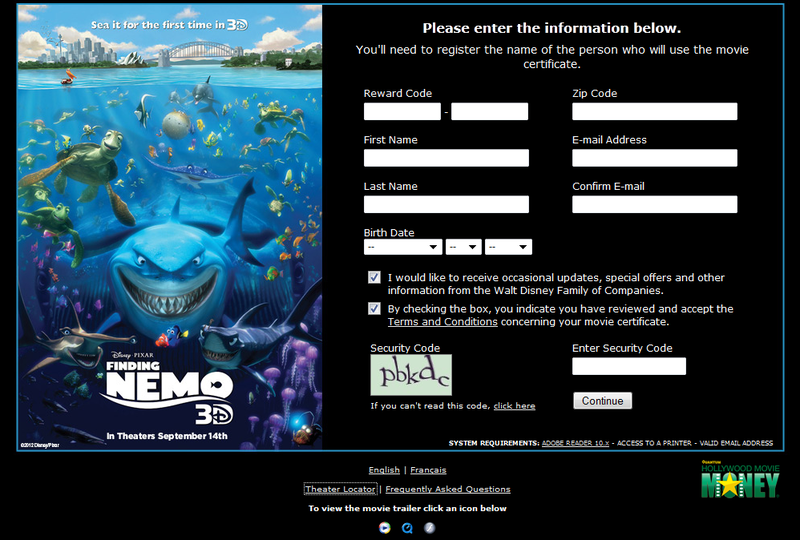 I checked to see which theater was playing Finding Nemo 3D at a time that worked for me and chose that theater. I didn’t have to use it at that time (in fact I had 2 whole months to use it for any day and time the theater was playing the movie) but knew we’d be going later that day so I wanted to make sure it worked with our schedule. The next screen that popped up was a “print certificate” screen. 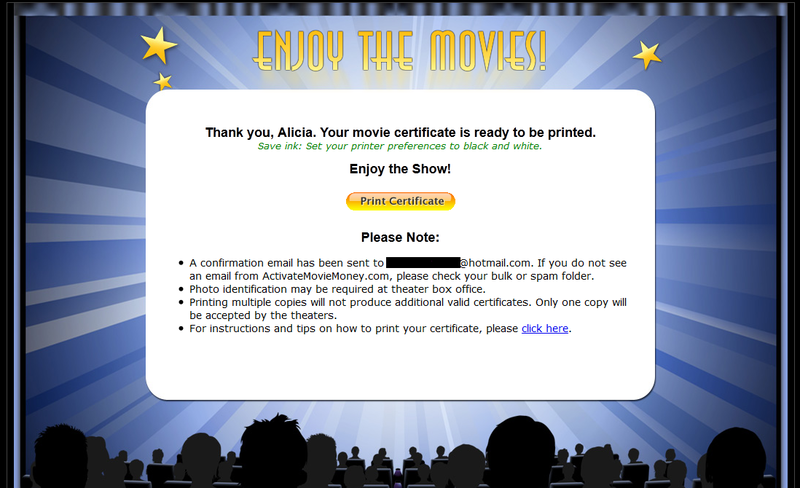 For a minute I was nervous because I wasn’t on my computer that was hooked to the printer but when I checked my email I noticed that the link was in there and I could pull up the movie certificate from my other computer. Once on the other computer I clicked the link and was taken to the page I needed to print. Once I read the terms and conditions I printed out my Movie Money and went on about my Saturday. As a busy mom that meant a morning class, a 5 year old’s birthday party, 2 different Walmarts in search of a specific item, work, and a little blogging. By the end of the day I was exhausted and looking forward to a night out with my little man. I grabbed a couple sweatshirts (is it me or is it always cold in the theater?) and we headed out the door. 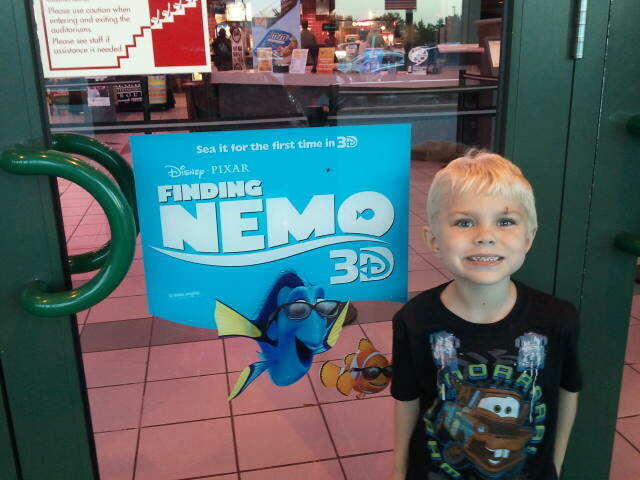 Jacob was excited to see characters from the Finding Nemo 3D movie on the outside doors of the theater and we thought it was funny that they were wearing 3D glasses. Once we walked in I went to the ticket counter and said “2 for Finding Nemo 3D please” and when she told me the amount I handed over my Movie Money to pay for my ticket just like I would have handed over cash or my debit card. I must admit that I am always nervous when using online sites to pre-order tickets, especially if I have never used the site, but there is a great guarantee I read on the Hollywood Movie Money site that reassured me and squashed any worries I had. The person behind the counter knew exactly what to do so she had apparently seen this Movie Money before. She typed in the number on my certificate and then added my certificate to a stack of papers on the counter. After I paid cash for Jacob’s ticket she handed us our tickets and directed us to theater 5. We were about 20 minutes early so we watched the screen in front of us for movie previews and learned more about television shows coming soon. Jacob continuously asked where everyone else was and I assured him that more people would come soon. More people did in fact come, but we were still in a fairly empty room. I figured it was because we were seeing a G rated movie at 7pm when many other kids were on their way to bed. I wasn’t sure how Jacob would do wearing the 3D glasses with his sensory issues but once he realized that if he didn’t wear them everything would be blurry he kept them on. I thought it was cute that they were orange just like Nemo. We both enjoyed the movie in 3D version and it was great to spend time one on one. Overall, my experience with Movie Money was a positive one and I would use it again. I liked that there were many theaters that participated so we had options to choose from. I thought the process of getting the tickets and redeeming them was just as easy as any online ticket purchasing option available. I also appreciated the fact that once I put in my promo code I didn’t have to choose a time and date I would be using it because not everything always goes according to plan. The only thing I would change would be to have the ticket that prints out have the name and location of the theater I chose to see the movie at and maybe a link to the theater’s page in the confirmation email so that I could easily get to the page to view what time the particular movie was being shown. I had to go back and double check what time the movie started since I didn’t remember the exact time and, while not necessary, it would have been nice to have a link to that information readily available.